The PCI-PLL-TESTER software is a closed program without any drivers, sources or other interfaces. Our goal was to collect the data coming into the tester into an Excel sheet by recording the print screen shots. Our mission was to program an interface that will be able to take in the data from the tester and transmit it into an Excel file. In the command-line, after the utility program name PLLtst.exe, add 4 parameters (more or less) for initialization of the PCIe_PLL_Test program. This is the stage were our program goes live. At this stage the utility program (or the controlling program) can close the EXE window. After waiting approximately 15 seconds, the results will be taken from the PCIe_PLL_Test program from the expedient windows and will be implemented in the simple text file C:\LV\Output.txt. It is by the responsibility of the utility program to erase the file before the next reading of the utility program. Red – is for parameters that the utility program changes too, according to the run and initialize command. Blue – is for results that the program reads and sends back (by the Output.txt file). Application Area: Learning the features of the transmission medium through sound waves. Inspecting in Real time, 2-20 kHz sine wave Receiving from 1 or more transmitters and transmit back a matching echo response sine wave. Combining the benefits of the NI Compact RIO FPGA together with the Regular GUI of LabView program on a PC for creating a rugged, semi permanent monitoring system that records multiple data formats and rates, synchronizes data, and performs real-time analysis to remotely monitor sensors for extended durations. SK- Electronika, is a total solution provider for functional test applications in the automotive, military, electronics, telecom, and medical industries. 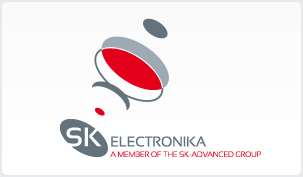 SK-Electronika, provides hardware and software integration services, based on National Instruments (NI) products like LabView, PXI, CompactRIO, Data Acquisition and more. Our client, working with a rigid test system based on VHDL language, found it difficult to make changes such as: new features, adding scenario tests and more. Every change took several months and needed a burning of the card. Also our client wanted a generic test system, one that can support more sophisticated and variant simulations on the FPGA, and inspect them on real time. Worldwide Bulk material supplies of raw goods, intermediates and finished products are all becoming scarcer. Companies wishing to optimize production have to measure levels of every drop of liquid, and every grain of powdered or granular products they use and supply. The products that are typically stored in tanks, vessels, bunkers and silos have to be under restricted Monitoring and Control. Of course, that means putting in the right IT to make sure it displays the correct and accurate readings. 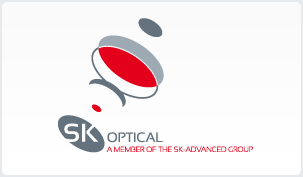 Our Client, offering its end- level Monitoring and Control system solution needed a reliable and flexible testing system, enable to simulate multiple Monitoring and Control situations with correct accuracy. The UUT transmits sound waves and receives back an acoustic emission that helps define the features of the transmission medium. Our challenge was to simulate different scenarios of the acoustic emissions coming back in response to the sound waves sent by the UUT. For this purpose we used the NI FPGA and connected it to the electronic contacts of a 2-20 KHz speaker. 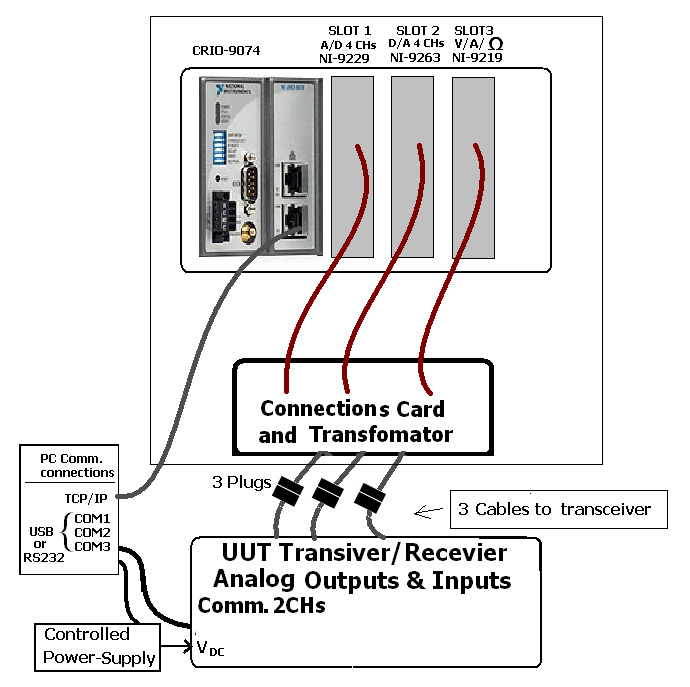 Electric pins to ground resistance and current consumption testing – using NI card 6221. Advanced testing tool for the system engineer. Using this tool allows the system engineer to upload parameters on the UUT device and test different scenarios. Also it enables to choose pre-generated scenarios and test the function of the UUT in response. Simplicity of the coordination card - the NI software allowed to receive a noise filtered signal. NI 6219 card technology enables the use of less electronics in the coordination card between the speakers and the FPGA. The advantage of a digital filter on the card gave us the benefit of a simplicity card that reduced the need for an additional noise reduction circuit. Upload numerous function scenarios via FPGA - the NI technology enables the upload of a mass data base onto the large memory card of the CRIO-9074 containing the FPGA. All this without needing to burn it for every change. The easy programing with LabView enables an easy and direct connection between the PC and the FPGA. This unique feature gave us the opportunity to connect to the FPGA and observe it. With the benefit of adding to the system engineer GUI a real time feedback from the FPGA and its status (false, register). The graphic interface gives the benefit of a programming approach that abstracts low-level complexity and allows a common and simple interface that enables more engineers to be part of the project. All this without them having a VHDL programing background. This gave the project the benefit of a major brainstorming team that contributed to the characterization of the system as well as to the testing system. The engineer staff could efficiently understand the language code and give their contribution. Reduce development time and stand extremely tight deadlines. Before NI LabVIEW, the development time of the FPGA took more then 1-2 months and included the assistance of outsourcing FPGA experts. Using LabVIEW reduced the developing time to only 2-3 weeks for every additional function change. All this while the LabVIEW engineer had only basic experience with the FPGA! The LabView engineer was able to work with the FPGA efficiently due to the excellent service and web support of NI. The NI support and service – fast repairs and service for the cards and meanwhile we received on the same day an alternative card to continue our work, orders where sent in a short time. Good web service and web support – we found it easy to navigate through NI site; answers were readily available and helpful. We chose Ni technology and LabView due to its user friendly technology, good support and common use. Ni technology is being learned in the universities. It is common and known world wide with a large support of the community expertise, drivers, hardware and more. The LabView key feature we used for this project was the ability to coordinate between an acquired electrical signal from an A/D card and the creation of a response in the form of an electrical signal via a D/A card, all this with a high time accuracy of less then 10 micro second. We controlled the feature including the method of sending back the wave, through the control panel inside the LabView software. The test debug features of the software as ell as the option to respond on real-time from the FPGA, were fast and straightforword. This feature gave us the advantage of creating a test system in short time that can immediately start working with a very good starting point and the open opportunity for future developments. Using Ni technology reduced the need of using several cards. For example: in the old test system the voltage testing was set by using an outsourcing DMM unit. We used available ports and inputs, like the available ports on the measuring card and this gave us the benefit of a more compact and comfort test system.